Tuesday, Marvel announced a sell-out and new printing of their big summer event. 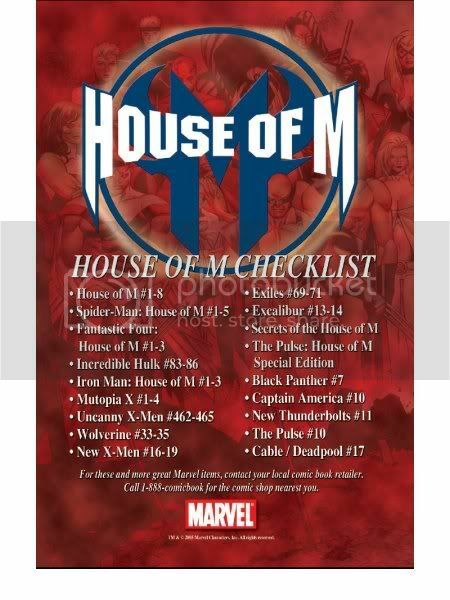 The publisher announced today that House of M #1 is sold-out at Diamond, two weeks before going on-sale June 1st, and that a reprint edition is now being offered. The House of M #1 Coipel Gatefold Limited Edition will feature a gatefold cover, the House of M poster/”group shot” by series artist Olivier Coipel, at no extra increase in the series’ cover price of $2.99. The new edition is scheduled to arrive in stores June 29th, one week after House of M #2. Retailers have until Thursday, 6/9 to place orders. Quantities will be limited, however, and in their announcement Marvel encouraged retailers to place orders as soon as possible to ensure getting copies. "Orders on House of M #1 continue to pour in to Diamond after record-breaking initial numbers,” said Marvel Director of Sales David Gabriel. “We've exceeded our available copies, so we're thrilled to go back to press for this special printing. We told retailers and fans that there would be copies available on this issue and we are going to live up to that promise."